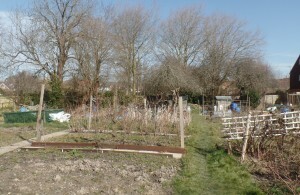 A significant service facilitated by Hailsham Town Council is the provision of allotments. At present, the Council manages 96 plots on three sites in Hailsham: Battle Road (59 plots); Station Road/Common Pond (14 plots); Harold Avenue (23 plots). Standard plots are 3 or 5 rods in size. Rental costs are: £23.10 per annum (3 rod size) and £39.60 per annum (5 rod size). A £50 deposit is requested for newly registering plotholders, which will be refunded at the time of cessation of allotment tenancy (provided the plot is left in a satisfactory and rentable condition). For further information, please call 01323 841702 or karen.giddings@hailsham-tc.gov.uk for details. Health: Benefits achieved through exercise and a better diet of fruit and vegetables! Environment: Benefits achieved through the use of fewer (if any!) chemicals, the composting of green waste and the recycling of materials. Community: Benefits achieved through social contact from sharing plants, tools, produce, and knowledge!